Is Your Reality a Prison? - Heart. Soul. Strength. Mind. Is Your Reality a Prison? So beautiful, but ultimately incomparable to the lushness of a living tree. I’ve been reading C.S. Lewis’s The Weight of Glory. It blows my mind, really. There’s a woman, an artist, who is pregnant and imprisoned in a tiny cell. The cell has a tiny sliver of a window high above. The tiniest glimpse of sky is visible. She gives birth. The son grows up seeing nothing but the gray walls of the prison cell. Of course, she wants her son to know what the outer world is like, so she spends her days sketching trees, rivers, animals and other aspects of the physical world. One day, her son makes a remark that indicates he believes the outer world is made up of lines like the ones his mother made on the paper. When she tries to explain, that no, reality is gorgeous and three-dimensional, he appears skeptical. It is beyond his imagination. We are like this boy. If it is not visible, not proven by a law of physics, not experienced by us directly, then we cannot believe it is real. Are we really that unimaginative? Are our minds really that small? Well, yes. I think we should be more humble about just how limited our capacity to understand the nature of universe actually is. Isn’t it arrogant, really, to believe that we understand even one percent of what is actually going on? So when people claim that visions are nothing more that neurons misfiring, or that demons are a product of an ancient and outdated mindset, I question that. Just because we are now aware of neurons doesn’t mean we have any idea why they behave the way they do, for example. My mind has been opened to all sorts of possibilities, and it was not because I wanted it to be. I was quite content in my ignorance, although not happy. I’ve learned that truly having an open mind doesn’t just mean having the desire to understand other people’s perspectives. It means that my mind is open to the idea that we just might not know very much at all, and that God has far more to teach me than any classroom could begin to offer. And I love that God’s kingdom is so much more lush than anything I can see. 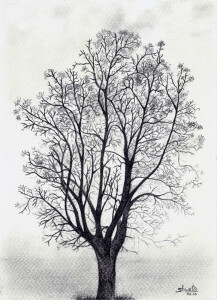 Click on the tree to see information about the artist. ← Is it Possible to Drown and Not Know it? Yes, reality is a prison because what, really, is reality? As I dealt with those pesky relatives, I realized that reality is in the eye of the beholder. Yeah, and the fact we can’t even see each other’s viewpoints emphasizes how little we perceive of what is, well, the other reality. It is really, really hard to get where people are coming from sometimes. It’s like they’re from another planet. Right on my friend…i don’t know how you put thee thigs into words, but you are masterful! !